Much of the day was taken up with dealing with my faulty PC, eventually diagnosed as a defunct hard drive. I did manage a mid morning trip to Stanpit to see a Red-breasted Goose. Although this species probably occurs annually in the UK, this is a very rare vagrant to Dorset and some previous records may have involved escapes from captivity. Being a first year bird and arriving with Dark-bellied Brent Geese from their shared breeding grounds on the Taimyr Peninsula, this bird fulfills all the criteria for a wild bird. This is a rare goose in world terms with a global population of under 40,000. The majority fly south from the Taimyr to a staging post on the Caspian Sea before heading to the Black Sea coasts of Romania and Bulgaria. Wintering Red-breasted Geese - Bulgaria. Photo from the internet. Also on show was a Dartford Warbler on Crouch Hill, whilst a Peregrine put all the waders to flight. 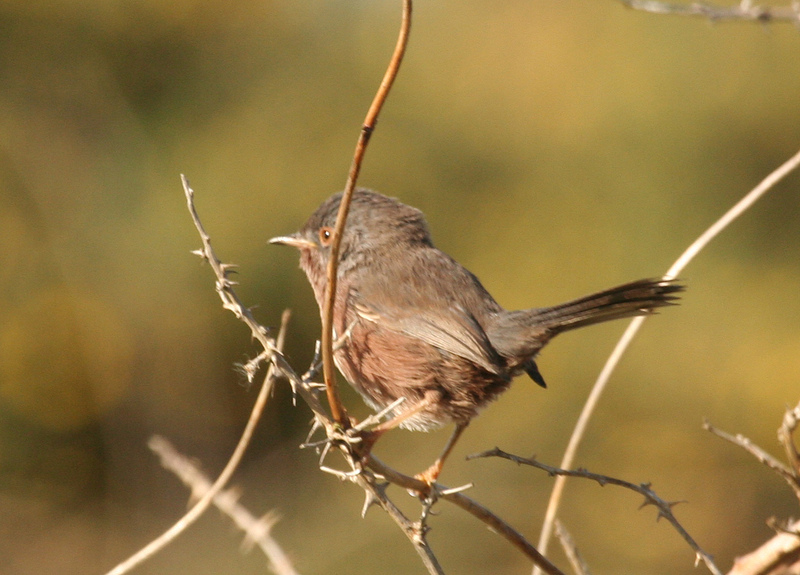 Dartford Warbler - Stanpit. Severely depleted after last winter, Dartford Warbler numbers may be increasing after this years warm, dry spring.